Tip #1 Remove standing water: Mosquitoes breed in water so any containers laying around your yard have got to go. Make sure your gutters are clean to keep any standing water from collecting. Drill holes in any containers like garbage cans to allow the water to drain. Regularly change water in bird baths or children’s pools. Make sure no puddles are forming under your air conditioners. Remove old tires or any other items that may collect water and turn kayaks and canoes upside down. Don’t just check your yard, but check your neighborhood for litter like soda cans or any other containers that can hold water. Tip #2 Get a net: Make sure it is an untreated mosquito net. Nets are an effective measure against mosquito bites. Aedes aegypti are one of the most likely mosquitoes to enter your home, and even though they are primarily early morning or daytime feeders, they have been seen feeding at night under artificial lighting. One study found that 23% of Aedes aegypti bites happened at midnight, so a bed net can provide protection while you sleep. For the rest of the day there are mosquito nets for strollers, cribs, gazebos…you name it. You can buy several varieties of mosquito nets, just make sure you get an untreated net or you will be exposed to insecticides. Tip #3 Use a fan: It is difficult for mosquitoes to fly when a fan is blowing because of their light weight. Keep a fan blowing on you when you are at home and you can keep the mosquitoes away. By having a fan blowing you can also keep your AC temperature set a little higher and save electric since an AC uses more electricity than a fan. Tip #4 Soap traps: Soap traps are one of the easiest and most effective ways to get rid of mosquitoes once they enter your home. The items you will need: A cup, a bottle or pretty much anything that will hold water. Water and dish soap, preferably clear colored. Put water in the container until it is about 1 inch high. Then add a good amount of dish soap, at least a couple of squirts. Make sure you put in the water first and then the dish soap. Make at least 10 traps and put them around your house especially in bathrooms and your kitchen. Remember to only use these traps indoors or an enclosed porch to avoid catching dragonflies or other beneficial insects. Also remember to number your traps and write down the location of each trap and post that on your fridge so you remember to check them. About every 2 weeks check your traps, clean them out and add new water and dish soap. 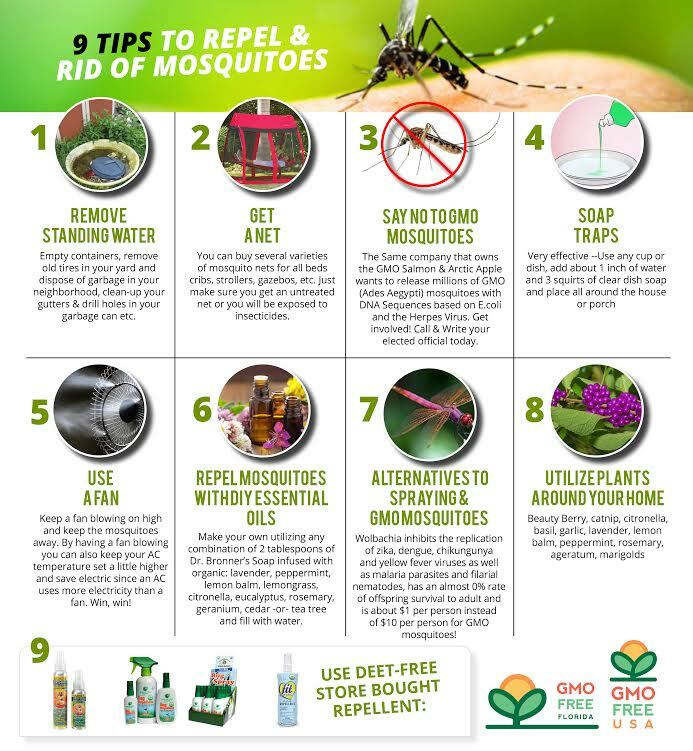 Tip #5 Say no to GMO mosquitoes: The same company that owns the GMO salmon and the GMO apple wants to release millions of mosquitoes in the U.S. including thousands of female mosquitoes than can bite and spread disease. These mosquitoes have a fusion of DNA sequences based on E.coli and the Herpes virus which code for a synthetic protein. This, and another synthetic protein, each have stretches of identical amino acid sequences of known allergens, which may cause allergic reactions when susceptible humans are exposed to these genetically engineered mosquitoes. Think you are safe if they aren’t released in your neighborhood? Think again. These mosquitoes can get in a car, plane or boat and end up in another city, state or country. Since thousands of these mosquito’s offspring can survive to adults there’s a good chance they’ll end up in your neighborhood. So make your voice heard and tell your elected officials that you do not consent to the release of genetically engineered mosquitoes. Make your own utilizing any combination of 2 tablespoons of Dr. Bronner’s Soap infused with organic: lavender, peppermint, lemon balm, lemongrass, citronella, eucalyptus, rosemary, geranium, cedar -or- tea tree and fill with water etc. Note: CDC mostly recognizes Deet as effective for Zika. Wolbachia inhibits the replication of zika, dengue, chikungunya and yellow fever viruses as well as malaria parasites and filarial nematodes, Works not just on adults, but, mosquito larva as well, has an almost 0% rate of offspring survival to adult and costs $1.00 per person vs. $10.00 pp for GMO mosquitoes. Saves $$$ & less spraying! *Again, Note: CDC mostly recognizes Deet as effective with Zika.